There are more than 500 neighborhoods within Jacksonville's vast area. Additionally, greater Jacksonville is traditionally divided into several amorphous areas, comprising large parts of Duval County. These are Northside, Westside, Southside, and Arlington, as well as the Jacksonville Beaches. Four of Jacksonville's neighborhoods, Avondale, Ortega, Springfield, and Riverside, have been identified as U.S. historic districts and are in the National Register of Historic Places. Jacksonville operates the largest urban park system in the United States, providing facilities and services at more than 337 locations on more than 80,000 acres located throughout the city. Jacksonville enjoys natural beauty from the St. Johns River and Atlantic Ocean. Many parks provide access for people to boat, swim, fish, sail, jet ski, surf and water ski. Several parks around the city have received international recognition. 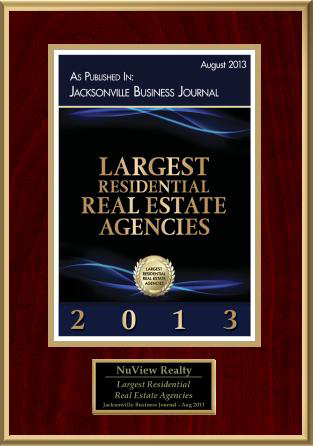 Welcome to NuView Realty, ranked as one of Jacksonville's largest real estate firms (Jacksonville Business Journal)! We hope you enjoy all the resources we have provided.